The Kafue National Park is much less visited than the others in Zambia, although it certainly provides the opportunity for some serious walking. 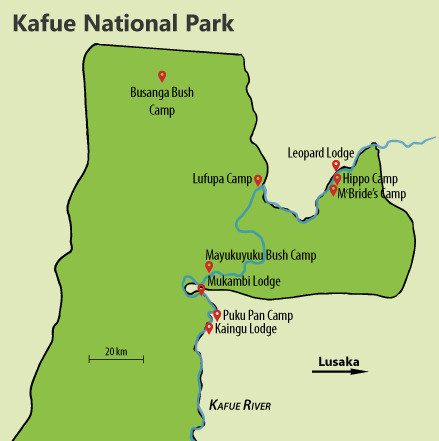 Because of the more limited appeal of this particular area (and indeed its huge size), we haven't actually built up any specific walking itineraries here as yet, and we would prefer to let you browse through the details of the area, and of the various camps located here, via our ZambiaAway website, in order to judge which areas might interest you the most, following which we can tailor an itinerary to your individual group size and (time and cost) budget requirements. The map above shows the various regions of the Park, from which an idea can be gained as to where you might wish to walk, or which areas you might wish to walk in between.